A DEVASTATED mum in China is begging doctors to help her seven-month-old son – who has a three-inch TAIL sticking out of his back. 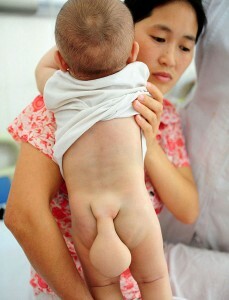 Little Xiao Wei was born with spina bifida, which means his vertebrae didn’t form properly. The result is a growth that protrudes out of the back of his spine and is STILL GROWING. Surgeon Huang Chuanping explained: “The growth is quite well developed and now measures some 10 centimetres. Myelomeningocele is the most common type of spina bifida, affecting 1 in 800 babies born. 3 Responses to "Mum begs doctors to help baby son who was born with a TAIL"
my heart goes to the little baby..
My heart goes to the Little baby.